In those more difficult moments, I sometimes feel like I’m just not cut out for this life. And that the people who really succeed at this kind of thing are those who are smarter, richer and have a bigger support network than me—a first generation entrepreneur from a barely middle class family that used to be poor. However, Mike Koenig’s story reminded me that people like me—or who come from far more humble beginnings than me—can and do succeed in business and, sometimes, do so in a big, big way. He is one such example and for me, the transparency with which he recounted his story is one of the most valuable lessons shared in the episode. From a working class community in Minnesota, Mike is the son of loving parents—a doting mom and a dad who was a barber and jack of all trades—who grew up with the bare necessities and wishing for the comforts that his parents were unable to provide. When people asked him what he wanted to be when he grew up, he’d answer “rich, warm and first” because his family was poor; Eastlakes, Minnesota, is cold; and, because his dad had to work so much, they’d always be last to all community events and get only leftovers. Mike taught himself to code at age 14 and started working in his own business, full-time at 16, consulting other business owners on technology and helping them meet their digital needs. He was self-taught in coding and self-taught in business and barely got a high school diploma. He was driven by a fear of not having enough because he came from a place of lacking in his childhood. I, too, know the pain and pangs of being told “we, simply can’t afford that.” I developed a defense mechanism of never asking for anything extra—so as not to make my parents feel bad because we couldn’t afford some things. I started working part time at 14. I have both a high school diploma and a college degree. I always knew that I’d be an entrepreneur, and I am driven by a need to take my family legacy and wealth to the next level because my parents took us from dirt poor to lower, middle-class. So, on the important touchstones, Mike’s story really drew me in and inspired me. We are more similar than we are different. Realizing this is what allowed the professional insights he offered during his chat with podcast host Dave Wills to really resonate with me as an entrepreneur. And I’m so glad this happened because Mike shared true gems for entrepreneurs whose businesses are media-centric—which is every business, now that quality content is king to promote and sustain growing businesses. Authenticity is far more important than being shiny and polished when trying to connect with an audience. This is a lesson that I admit to being slow to learn. I am often at odds with my twin sister and business partner, Melissa, because of my innate need to have things done perfectly and polished versus her desire and innate ability to get things done in a real, relatable and realistic way. I think I’ll definitely be more open to trying things her way after listening to Koenigs’ point of view on things. This was Mike’s response when host Dave Wills asked about how to conduct great interviews. He said that when he interviews people, he tries to get an understanding of who they are and how they think—something I’ve been trying to master since I was editor of my university newspaper over a decade ago. Mike’s big secret was to do as much research as possible, ask “heart-driven” questions and develop your own structured approach to each and every interview. As I stated before, Mike is a 13-time, no. 1 best-selling author. So it should be no surprise that he states unequivocally, “if you’re a published author, it gives you credibility—people are more inclined to think that you know what you’re talking about.” He indicated that there are a bunch of hacks to writing books nowadays that didn’t exist years ago. They make the process of writing and publishing books to propel your beliefs and brand forward much easier. Until listening to this episode of the EO 360° podcast, I’d never considered writing a book a feasible or wise thing to do at this point in my life and career, but now I’m strongly rethinking my position! Mike Koenigs has had an inspirational and aspirational entrepreneurial journey to date, but it’s not unique. All of us entrepreneurs have had to battle our own challenges. 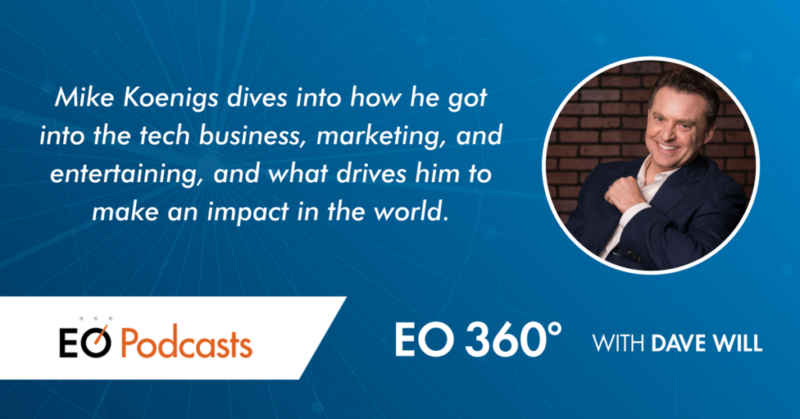 Listening to this episode of EO 360° podcast, however, has cemented the power in telling my story—how I tell it and whom I tell it to as well as how I use it to guide my next steps. So, my questions to you are: How will you tell your story? Who will you tell it to? How will it guide your next steps on your journey? Michele Matthews-Morancie is co-founder of several businesses. 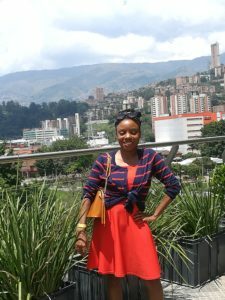 Through Agitate Media, she and her twin Melissa Matthews stir social change by developing and facilitating workshops and training sessions, addressing topics from strategic communications and relationship-building to board development and fundraising.